That’s the way I describe our trip to the UK all the time to those who ask why we’re here and to myself. My goal for the trip was to learn what it’s like to live in the UK. It isn’t really a vacation in the sense of seeing the sites, though we’ve done that. 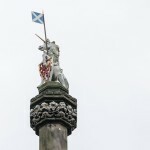 So what have we done and accomplished while in Scotland? On our first Monday a model friend of mine Danielle and her Scottish boyfriend Jon took us on a walking tour of Edinburgh. Jon gave us an insight into both the touristy/historical stuff on the Royal Mile, and some modern political things. 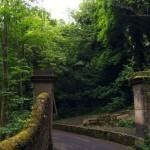 They also showed us an incredibly beautiful forested walk in the center of the city called the Dean Gardens. 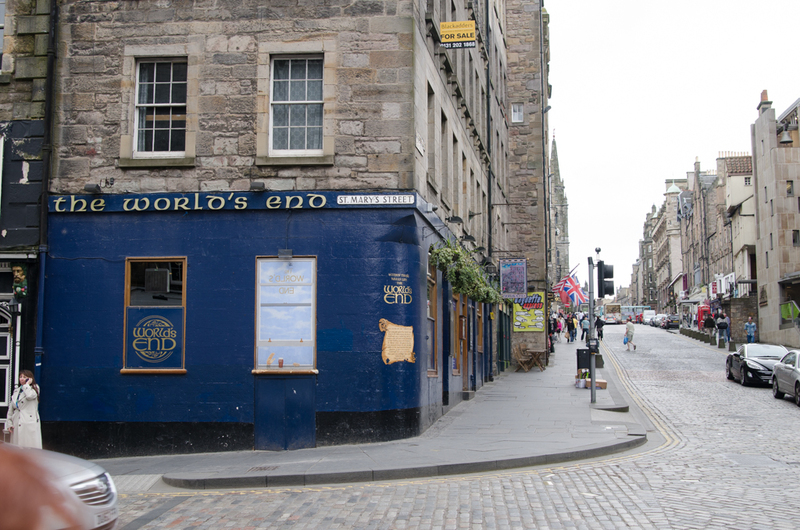 There is a pub on the Royal Mile called the World’s End. I thought had to do with the Simon Pegg movie of the same name, but I should have known better. 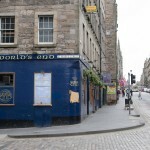 First of all the words “The World’s End” are carved into the street and have been there for hundreds of years. 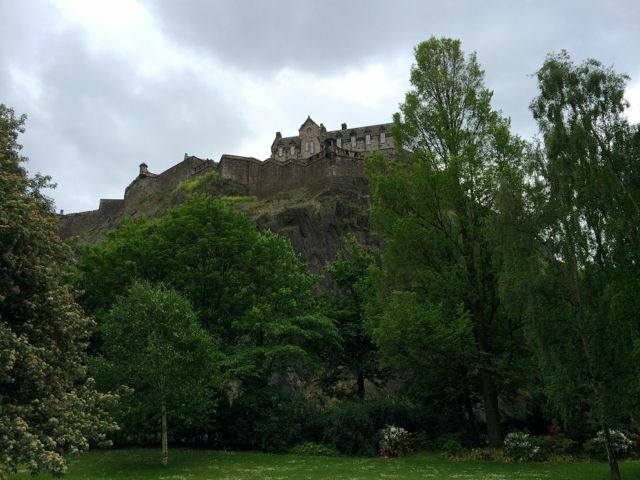 Jon explained that line was where old Edinburgh ended, stretching from the castle down the royal road. This was the only way to approach the castle and you could put a canon at the top and shoot all comers. In typical Scottish humility it was called The World’s End because that was where the true Scotland ended, hence the end of the world. 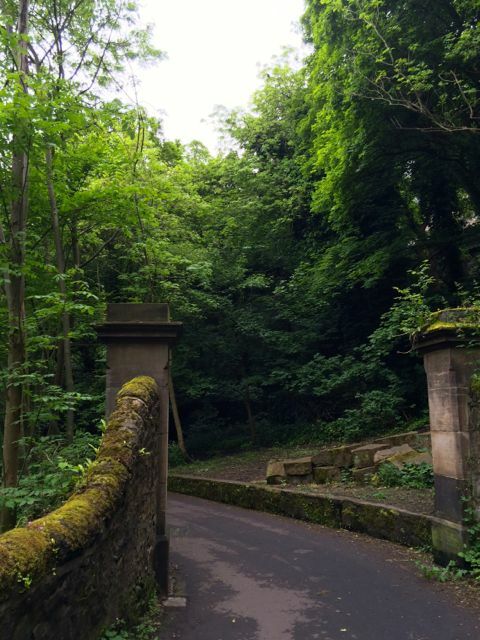 Edinburgh is a pretty walkable city, but that does add quite a bit of time to any trip you might make if you walk everywhere. Plus you will get tired walking all the time. So we’ve been riding the bus a lot. It’s now gotten to the point I’m getting a feel for which buses go where and can catch one without having to look at a schedule. I will say Edinburgh bus service has a very nice iPhone app. It does a great job of routing you from place to place and tracking your movements once you are on the bus so you have an idea of where to get off. Of course that depends on the driver deciding to actually stop at all the stops listed on the route, which doesn’t alway happen. You can also buy tickets via a second app. I’m not sure why there are two apps, but there are. You have to buy £10 worth of tickets at a time because of the percentage they have to pay Apple for the in-app purchase. Then you activate the ticket right before you get on the bus and show your phone to the driver. There are two kinds of tickets. A Single which is for one ride from A to B and costs £1.50. A Day Pass which lets you ride all you want for the whole day and costs £3.50. This means we get to figure out if we’re going to do more than one there and back ride in a day to pick which one to use. Also many of their buses are double decker buses. You may be thinking of the quaint old double decker buses you’ve seen in movies, but they are modern buses with two levels of seats. Most of the one that are single level are hybrids, which is also interesting. One other thing I’ve noticed, and the thing that has most made me think “Why are we doing this for this long?”, is we’re spending a lot of time just the two of us. We’ve been married 20+ years and enjoy each other’s company, but there are times we start getting on each others nerves. Couple that with being in a strange country where we basically know no-one and you can feel both crowded and lonely at the same time. Still we make do. We understand each other enough to know when we need to spend some time apart and one of us will go explore the city or work in a coffee shop to give the other some alone time. The other – meeting people – is harder. I’ve become quite the introvert and that’s a struggle if I want to meet people in the UK. Heck, now I look back at Abilene and realize that after almost 2 years there I only know a handful of people. How did I expect to make friends here in just a month? Probably the biggest social occasion we’ve had was visiting Toastmaster clubs here. This was the first place where we’ve had a chance to just meet people and talk. Of course meeting people was one of the reasons we joined Toastmasters in Abilene too. 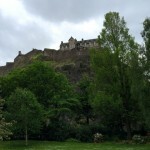 That’s my brain dump of what’s been going on during our grand adventure in Scotland. After writing it, I realize I need to be more proactive finding opportunities to meet and talk to people. Also the Edinburgh Film Festival is coming up in the next couple of weeks and I plan to go to a number of the films and the video game symposium. I also think I need to try and learn something while I’m here, I’m just not sure what.